Makeup Forever, aka the gold standard for cutting edge makeup, recently came out with (spoiler alert) my new favorite lipsticks. I was extremely fortunate that Influenster sent me three shades to review (to be clear, I paid nothing for these, and they still blew my mind.) "You're getting MUFE lipsticks" -it was literally the happiest email I've gotten in months. So let's start with my favorite parts: the design (specifically the extremely pointy and beautiful tip you start off with), the staying power, the insane color payoff, the price (yes, the price), the application, the formula, the color selection, and the finish. At the end we'll talk about the unfortunate transferring that happens, and the easy solution to all your smudging woes. I'm still having mixed feelings about the sleek minimalist packaging, but I'll get to that eventually. All in good time. 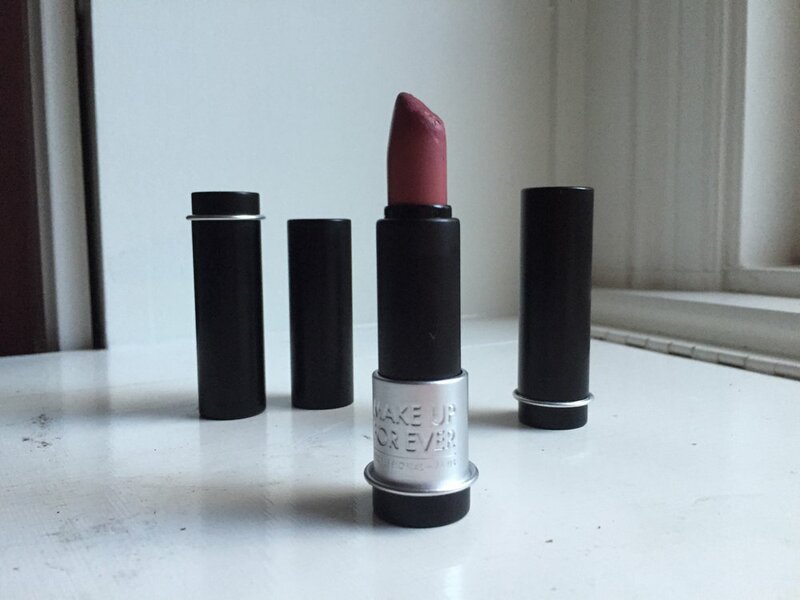 This lipstick is literally pure magic when you first twist it up. Not only is it amazingly beautiful and sometimes Barbie-lipstick shiny, but it has the sharpest most clean edge I've ever seen. Unlike most lipsticks that have a wider tip, this lipstick comes to a sharp apex, and it's beautiful. The narrow design allows for maximum control; I was able to get the sharpest line, no lip liner necessary. (Like hallelujah you just saved $12.) Unfortunately I'm still trying to figure out how to preserve this perfectly designed bullet (it's more of a spear if we're honest). I might ruin this beauty by using it, but it's worth it. If I have to have my cake or eat it, I'll eat it. Especially when it is a beautiful lipstick that goes with all my outfits. Not only is the point perfect, the shape of the bullet makes application easy. It may not sound like a big thing, but honestly the shape of a lipstick can make all the difference-especially for beginners. Although, if you're already a makeup master then this design detail is just a bonus feature. In all of these photos, unfortunately, I have already used the product extensively, so you don't see that crisp line, but if you want to see me unboxing these puppies for the first time head over to our YouTube channel for that goodness. The cream formula, to me, seems like a luxurious matte. Basically it just looks like a smooth color with no real finish. I noticed when I smiled you could see a slight sheen, but for the most part the cream formula is almost matte, which is nice. I am so curious to know what the matte lipsticks look and feel like. If you're looking for a glossier finish, you can always add a clear gloss on top! Do you see this Barbie level shine? Is that real makeup? Because you could be looking at a plastic lipstick, it's literally that perfect. 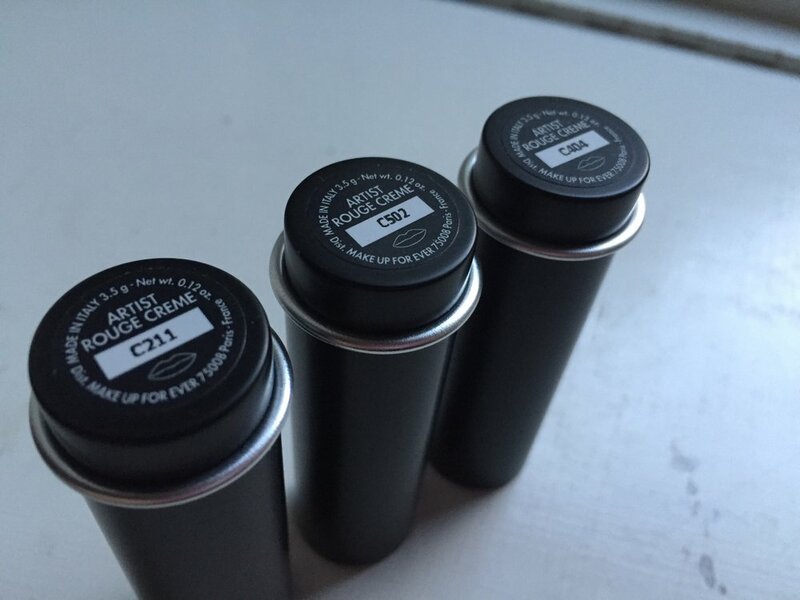 I was sent three shades; C211, C502 and C404. So these retail for $22. I think that is a fair price considering I've paid $35 for subpar lipsticks. You get 0.12 oz per tube, which for reference a standard lipstick sample is 0.03 oz. It's like buying four samples. It's a lot. How often do you finish those things? Exactly. Like never. They have 45 shades (which I intend to swatch all of them at Sephora, the website isn't entirely accurate, and too many of these shades look the same on my screen for me to just pick them willy-nilly online.) I appreciate the shade range, and I actually hope they come out with more: yellow, orange, more purples. This is one line of makeup where you see black, white, and mint, rare occurrences in the lipstick world. I'm very interested to see how that white lipstick swatches. This stuff is soft, though, so if you accidentally hit it, it's going to get ugly. They're also easily dented by dry lips (see above.) As great as these things are, I wish they weren't so delicate and easily ruined. I'm entirely too clumsy for this. C502 Surprisingly opaque, incredibly gorgeous. I think this gray violet shade will look great on a lot of skin tones, but I think many people consider purple lipstick out of their realm. But I think it is totally doable. Be bold, my friends! So Influenster sent me three cream shades, and so I can only attest to that formula, but let me just say it's pure gold. It's very comfortable on the lips, not too moisturizing (which I prefer, if it slides around like Chapstick I guarantee you it will be all over my face and bagel by 8:03 AM), the color payoff is impressive, and the formula overall is very strong. I like that they don't give you too much product either, and that might surprise you, because I love bonus product whenever I can get it-but ever since Stowaway cosmetics introduced me to the idea of tiny makeup (makeup you can use before it expires) I've been loving small portioned cosmetics. So this one was a win for me. Also this lipstick does not have a smell! Yes! It doesn't smell like vanilla or citrus or cosmetics it just doesn't smell! I appreciate this so much in a lipstick. Here's me trying to take a selfie and demonstrate how perfectly this fits into the contours of the lips. Ignore my face of concentration. This lipstick is a one-swipe genius kind of formula. You need the tiniest amount of this stuff to cover your natural lip color. Even in the weird shades, I didn't see any streaking or bald patches. It was just smooth bold color after ONE swipe. 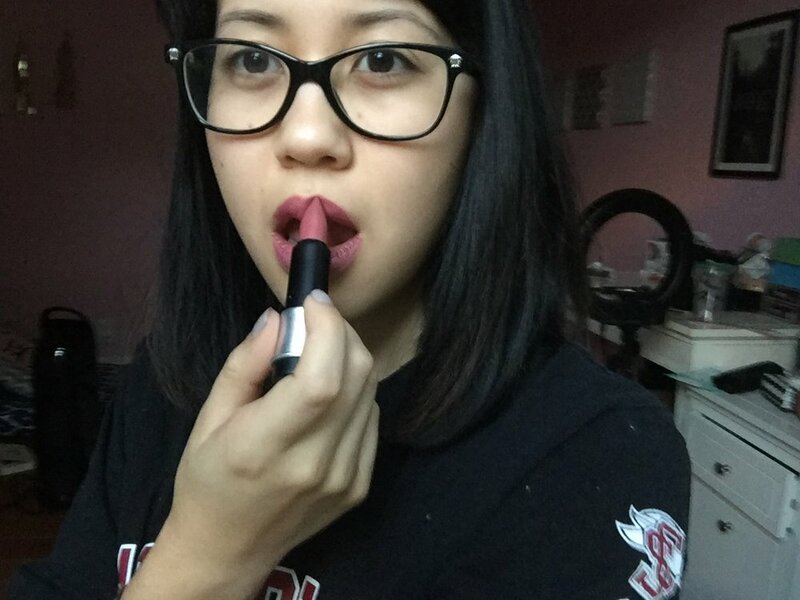 So this lipstick can really stick around. Here I pressed my swatched hand against my leg multiple times and the color on the back of my hand still looks pretty good if you ask me. This product does transfer easily, so it will be on your morning cup of coffee, significant other's face (and/or dog), and basically everything else. I was impressed that I didn't get this lipstick on my teeth but I managed to get it everywhere else. My solution was to pat off the excess product onto a tissue and wear the lipstick almost like a stain. It worked like magic. Additionally you can set your lipstick with translucent powder or just not apply too much. The color will still be vibrant and opaque for hours. Overall these lipsticks are incredible, and I intend to try them all, eventually. I have been wearing these everyday this week, if that gives you any idea of how much I love these. I would recommend these to anyone looking for a gorgeous lipstick with intense color and staying power. These are also going to be great for lip-artists. Having a black and a white lipstick seems like a game changer.